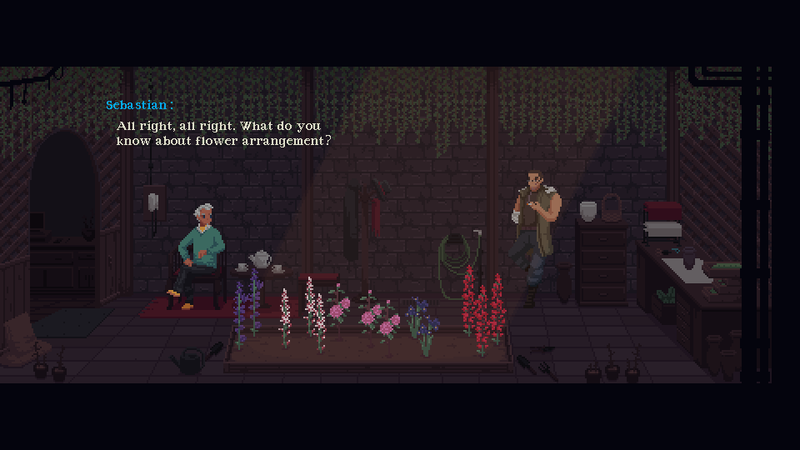 Eternal Home Floristry is a narrative experience about a hitman working at a flower shop while his injuries heal. This game was made in less than 72 hours for the Ludum Dare 43. Theme: "Sacrifices Must Be Done." This almost me cry when I reached the ending. It’s so beautiful and heartfelt, especially with the developing relationship between Gordon and Sebastian. I managed to see two endings, but I wonder if the other two are the same. Great game! I can’t wait to see more! Muy buen juego, muy bello. Les agradezco. I absolutely love the soundtrack! Is there any place where I can pay to have access to it? Really appreciating this work of art. Finds a way to deconstruct more complex sentiments into basic ones, through flowers. Hi. I'm your new fan from South Korea. I was very touched when I played this game. I even made a video with subtitles in my language! Thank you guys for making a wonderful one. I also love the music. Every game that comes from the creative mind of Deconstructeam really is a wonder! 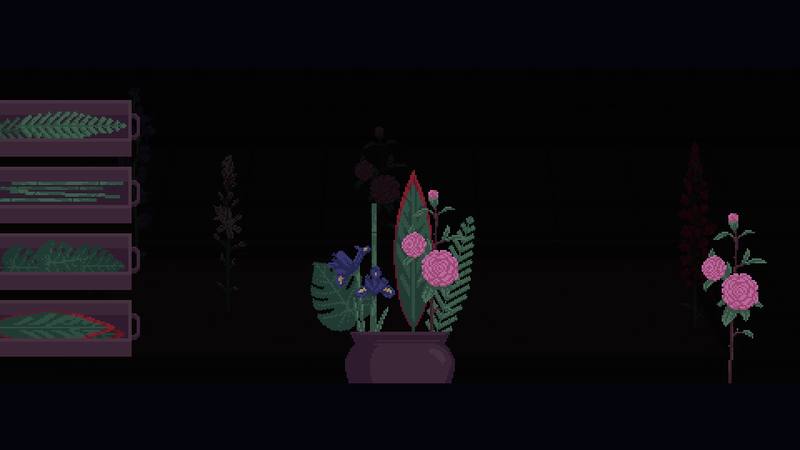 Who would ever think to make a florist / crime / romance adventure game? It just blows my mind! Ahem, anyway! 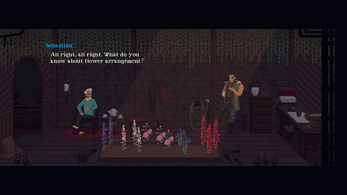 This is a real delight of a game where you play as a hitman who has suffered a seemingly career-ending injury who finds himself becoming the apprentice of a lonely florist (who also has ties to crime, who'd have thunk it?). 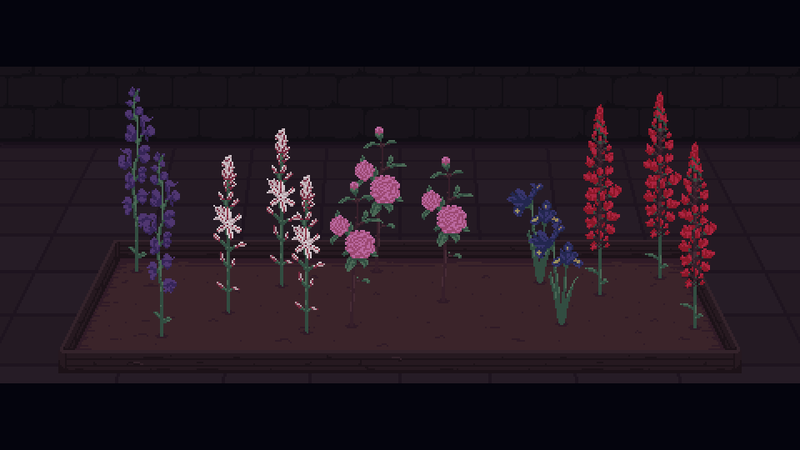 As we learn about the different flowers and what effects they have we also put together bouquets for a variety of different people, and the flowers we select have a direct effect on where the plot goes from there. It really is a clever little game, and I really do urge you to go and give it a whirl! It's definitely a once in a lifetime experience! Thank you for making this. I enjoyed experiencing it and am in awe that it was completed in 72 hours for LD43. 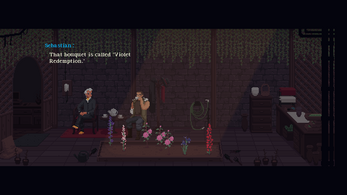 As a noir game/story, Eternal Home Floristry really brought its artistic elements together cleanly. The pixel art was appropriately stylized, the ambient music was just right, and the sound effects were strikingly compelling. The feeling of this game–its aesthetic, its mood–was impressively coherent, especially given how quickly it was made. Though the details of the story were largely foreign to me, the themes were human and I found myself smiling at times and sighing at others as different points of the story resonated with me. There were a few English spelling/grammar errors, but they were minor. In all, this was worth the 10–15 minutes it took to play! Thank you for sharing it with the world. As an aside: I ran this game on macOS using Wine 3.0.4 and it ran great! I really enjoyed this. More than I even thought I would, honestly. It pacts a lot of punch in such a short amount of time. The flower mechanic is also very fun, sort of nostalgic for decorating games I played as a kid but mixed with this dark, melancholy atmosphere. Y'all are great. If you are interested in making a Chinese language version, please send me the text of the dialogue script. I will do it. I really like this game. This is really cool! When playing it through WINE on Ubuntu 18, I don't see the "done" prompt on the bouquet and so can't progress beyond the first. I think WINE must just be forcing the game to do something it wasn't intended to. Would def still recommend this to Windows users though. Lovely game! 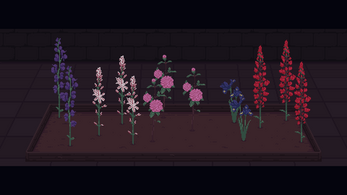 Lots of flower combination which means lots of different outcome per play through! I encounter an error when using blue, blue, red flower combination for the funeral bouquet. I can use that combination for other bouquet but the funeral. Hope it will be fixed soon! As usual, your game is full of emotion, and... wow ! 72h to build a game like this is incredible ! At first, I wanted to put you in my video of the Ludum Dare 43, with 7 other games I selected. But ... I couldn't. I had to make a whole video about your game and your studio, because I think you can be really motivating and inspiring for other game creators. This is a pretty cool and original game, love it! P.S. I found a confusing repetition the first bouquet delivery, something like "There will be another family taking the business". This was such a lovely game! I loved learning about the meanings of each flower! I feel like Sebastian was a father figure Gordon would've have needed and wanted, it hurt me so much that he died; I cried a little. ah i want to play this so bad! will it be optimized for mac or to be played in browser in the future?